For the English railway and civil engineer, see Robert Stephenson. 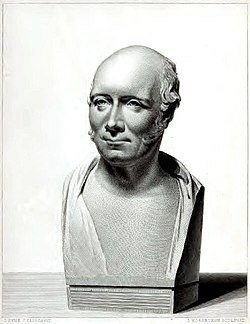 Bust of Robert Stevenson by Samuel Joseph, commissioned 19 July 1824 by the Northern Lighthouse Board. Robert Stevenson, FRSE, FGS, FRAS, FSA Scot, MWS (8 June 1772 – 12 July 1850) was a Scottish civil engineer and famed designer and builder of lighthouses. One of his finest achievements was the construction of the Bell Rock Lighthouse. Stevenson was born in Glasgow; his father was Alan Stevenson, a partner in a West Indies sugar trading house in the city. Alan died of an epidemic fever on the island of St. Christopher in the West Indies on 26 May 1774, when Stevenson was still an infant. At much the same time, Stevenson's uncle died of the same disease, leaving Alan's widow, Jean Lillie, in much-reduced financial circumstances. As a result, Stevenson was educated as an infant at a charity school. His mother had intended Robert to join the ministry and to this end sent him to the school of a famous linguist of the day, Mr. Macintyre. However, in Stevenson's fifteenth year, Jane Lillie married Thomas Smith a tinsmith, lamp maker and ingenious mechanic who had in 1786 been appointed engineer to the newly formed Northern Lighthouse Board. The family lived at 1 Blair Street off the Royal Mile in Edinburgh. In 1798/9 they moved to the then newly built 2 Baxters Place at the head of Leith Walk. Stevenson inherited the house when Smith died in 1814. Stevenson served as Smith's assistant, and was so successful that, at age 19, he was entrusted with the supervision of the erection of a lighthouse on the island of Little Cumbrae in the River Clyde. He devoted himself with determination to follow the profession of a civil engineer, and applied himself to the practice of surveying and architectural drawing and attended lectures in mathematics and physical sciences at the Andersonian Institute at Glasgow. Study was interleaved with work - his next project was lighthouses on Orkney. He made use of winter months to attend lectures in philosophy, mathematics, chemistry and natural history, as well as moral philosophy, logic and agriculture at the University of Edinburgh. He did not take a degree, however, having a poor (for the time) knowledge of Latin, and none of Greek. In 1797 he was appointed engineer to the Lighthouse Board in succession to Smith; in 1799 he married Smith's eldest daughter Jean, who was also his stepsister, and in 1800 was adopted as Smith's business partner. The most important work of Stevenson's life is the Bell Rock Lighthouse, a scheme long in the gestation and then long and extremely hazardous in the construction. This structure was based upon the design of the earlier Eddystone Lighthouse by John Smeaton but with several improvements. The involvement of John Rennie as a consulting engineer in the project led to some contention for the credit upon the successful completion of the project; particularly between Alan Stevenson, Robert's son, and Sir John Rennie, son of the consulting engineer. Samuel Smiles, the popular engineering author of the time, published an account taken from Rennie, which assisted in establishing his claim. History, and the Northern Lighthouse Board, give full credit to Stevenson. Stevenson's work on the Bell Rock and elsewhere provided a fund of anecdotes of the danger in which he placed himself. Returning from the Orkney Islands in 1794 on the sloop Elizabeth of Stromness, he had the good fortune to be rowed ashore when the Elizabeth became becalmed off Kinnaird Head; the ship was later driven back by a gale to Orkney, and there foundered losing all hands. On Bell Rock, which was covered by all but the lowest tide, he tells of an occasion when one of the crew boats drifted away leaving insufficient carrying capacity for the crew in the remaining boats; the situation was saved by the timely arrival of the Bell Rock pilot boat, on an errand to deliver mail to Stevenson. Stevenson served for nearly fifty years as engineer to the Northern Lighthouse Board, until 1842, during which time he designed and oversaw the construction and later improvement of numerous lighthouses. He innovated in the choice of light sources, mountings, reflector design, the use of Fresnel lenses, and in rotation and shuttering systems providing lighthouses with individual signatures allowing them to be identified by seafarers. For this last innovation he was awarded a gold medal by King William I of the Netherlands. The period after Waterloo and the end of the continental wars was a time of much improvement of the fabric of the country, and engineering skills were much in demand. Besides his work for the Northern Lighthouse Board, he acted as a consulting engineer on many occasions, and worked with Rennie, Alexander Nimmo, Thomas Telford, William Walker, Archibald Elliot and William Cubitt. Projects included roads, bridges, harbours, canals and railways, and river navigations. He designed and oversaw the construction of the Hutcheson Bridge in Glasgow, and the Regent Bridge and approaches from the East to Edinburgh. He projected a number of canals and railways which were not built; and new and improved designs for bridges, some later adopted and implemented by his successors. He invented the movable jib and balance cranes as necessary part of his lighthouse construction; and George Stephenson acknowledged his lead in the selection of malleable rather than cast-iron rails for railways. He was made a Fellow of the Royal Society of Edinburgh in 1815. His proposers were John Barclay, John Playfair and David Brewster. He published an Account of the Bell Rock Lighthouse in 1824; a paper on the North Sea, establishing by evidence that it was eroding the eastern coastline of the United Kingdom, and that the great sandbanks were the spoil taken by the sea. He devised and tested the hypothesis that freshwater and saltwater at river mouths exist as separate and distinct streams. He contributed to the Encyclopædia Britannica and the Edinburgh Encyclopædia, and published in a number of the scientific journals of the day. He was inducted into the Scottish Engineering Hall of Fame in 2016. In 1799, Robert married Jean Smith, Thomas Smith's eldest daughter by his first wife (i.e. his step-sister). A number of their children died young including three who died of childhood diseases early in 1808 during the construction of Bell Rock. Five survived till adulthood. Three of Stevenson's sons became engineers: David, Alan, and Thomas. Robert's surviving children also include Joseph (1802-1878), who emigrated to Victoria, Australia in 1832, and Jane (1801-1864), who assisted in writing and illustrating an account of the Bell Rock Lighthouse construction. Robert Louis Stevenson was his grandson, via Thomas, and Katharine de Mattos was his granddaughter. Stevenson lived on Baxters Place at the head of Leith Walk for most of his later years, moving from no.2 to the far larger no.1 around 1820. The building was used as an office from 1985 to 2015 and was named "Robert Stevenson House" in his honour. The name was removed when the building was converted into a Marriott Hotel in 2017. Stevenson died at 1 Baxters Place on 12 July 1850 in Edinburgh. He is buried in the Stevenson family plot in New Calton Cemetery. Stevenson College, Edinburgh was founded in 1970, and was named after Robert Stevenson. For at least some of his life Robert Stevenson lived at 1 Baxter's Place, Edinburgh, a building that was briefly Robert Stevenson House in his memory. Robert (and his father) are also memorialized in the churchyard of Glasgow Cathedral on the grave of his grandfather, Robert Stevenson (d.1764), a Glasgow merchant. Bella Bathurst wrote a biographical account of the professional accomplishments of Stevenson and his sons in The Lighthouse Stevensons (Harper Collins Publishers, 1999, ISBN 0-06-019427-8). ^ Former Fellows of the Royal Society of Edinburgh, 1783 – 2002: Biographical Index, Part Two (PDF). The Royal Society of Edinburgh. July 2006. p. 883. ISBN 0 902198 84 X. ^ a b "NLB - Robert Stevenson". Retrieved 28 January 2013. ^ a b Historic Environment Scotland. "Regent Bridge carrying Waterloo Place over Calton Road including Railings (Category A) (LB27945)". Retrieved 18 March 2019. ^ Letter from George Stephenson June 28, 1821 quoted in Stevenson, David (1873). The Life of Robert Stevenson, Civil Engineer. p. 128. Retrieved 19 July 2015. ^ "Scottish Engineering Hall of Fame" Retrieved 20 March 2018. 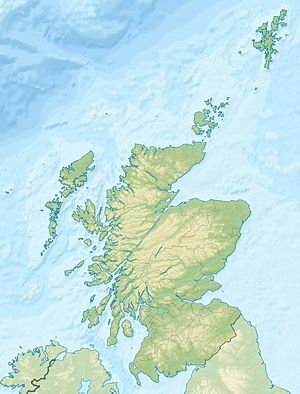 ^ "Stevenson Lighthouses in Scotland" Archived 13 January 2014 at the Wayback Machine. Robert Louis Stevenson Website. Retrieved 12 January 2014. Life of Robert Stevenson: Civil Engineer (1878), by David Stevenson. From Internet Archive. 'Records of a Family of Engineers (1995), by Robert Louis Stevenson. From Project Gutenburg. Chisholm, Hugh, ed. (1911). "Stevenson, Robert" . Encyclopædia Britannica (11th ed.). Cambridge University Press. This page was last edited on 18 March 2019, at 21:46 (UTC).